St. Thomas, USVI, February 01, 2013: St. Thomas, United States Virgin Islands-based McLaughlin Anderson Luxury Villas is now providing its rental guests with complimentary access to Villa Life, a fully integrated mobile solution that furnishes island information and access to local island management services. The app is available for iOS and Android download. Before arrival, users are able to examine a number of options for planning activities and special services, such as marine excursions, spa and personal training appointments, and car rentals. 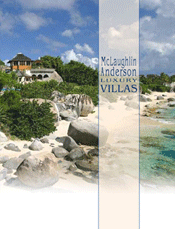 Concierge and Guest Services may be requested directly from the app, in addition to via email or telephone, enabling easier access to McLaughlin Anderson Luxury Villas staff. Once on island, villa guests are able to make contact while on the go, through a variety of devices, including iPads, tablets and smartphones. When issues arise that require maintenance, guests now have an easy way to submit a service request directly through the app. Reaching the correct staff member right away is key to a satisfactory experience for the renter as well as ensuring a most swift and efficient resolution. Vacations are for relaxation, connecting and adventure, after all! The Glad to Have You™ app is flexible, extensible and already making quite an impression in the connected world. Glad to Have You™ is designed for mobile devices using iOs and Android, which includes iPhone, iPad, iPod Touch, and all Android-based smartphones and tablets. Guests can invite others traveling with them to download the application and have access to the same custom information. Guests can access all the information, not only on a mobile platform but also through the personalized web portal as well. McLaughlin Anderson Luxury Villas President Nancy Anderson saw a demo of the platform online and is enthusiastic about being among the first to utilize the app. She is also impressed with the Glad to Have You™ team: "The new app will enable our guests to have everything about their villa and the island at their fingertips at any time. This premier company is leading the way to more enhanced communications between hospitality professionals and their special guests!" Glad To Have You™ uses mobile and social technology to connect vacation rental managers with their guests. According to its web site, Glad to Have You™ was developed by seasoned mobile application developers and vacation rental managers who love to travel and enjoy destinations all seasons of the year. They have designed resources for vacation property managers that enrich the guest experience and maximize revenue streams. To download McLaughlin Anderson Luxury Villa's "Villa Life" app, visit the (Android) Google Play Store or the Apple iTunes App Store for iPhone.